Bumble bee pollinating Blue Giant Hyssop flowers. Seawood Harbor is a small shore community located within the salt marshes of Barnegat Bay, bordered by the Edwin B. Forsythe National Wildlife Refuge. 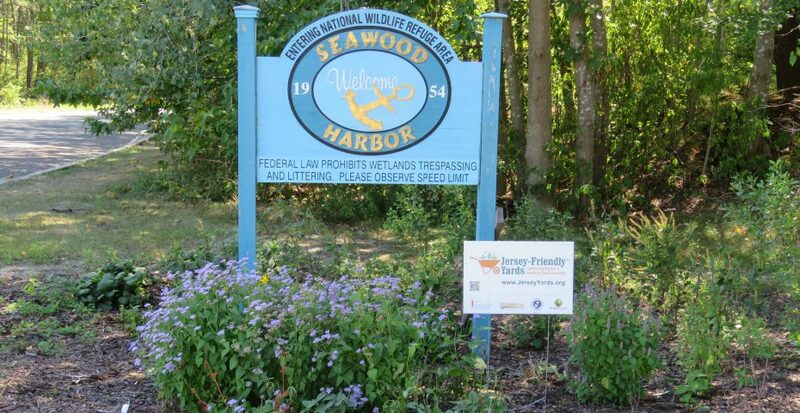 The Seawood Harbor Property Owners Association is a volunteer group that initiated a garden plan, under the leadership of community member, Adrienne Ferrie. The location of their Jersey-Friendly garden is at the roundabout on Mandalay Road, surrounding the neighborhood welcome sign. The compacted soil within the garden site was loosened to 6 inches and amended with compost. The light conditions vary with some areas of the garden receiving part sun and some areas in part shade. 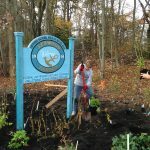 Shrubs and perennials were selected from the Jersey-Friendly Yards Plant Database with characteristics including drought tolerance and deer resistance.